Much of the literature concerned with state repression and human rights violation relies upon data that is aggregated at the nation-year. While this has provided information that has been useful in exploring some explorations, it has hindered others. For example, we have implicitly been focused on yearly aggregated influences and dynamics. This is problematic because existing research has consistently identified that lagged repression is one of the most if not the most important variable in estimated models. As a consequence, we should probably incorporate an investigation of lags explicitly into all of our investigations. Related to this, it makes sense to shift our theoretical orientation from arbitrarily determined yearly aggregations to consider spells/campaigns of repressive behavior. Such an orientation prompts us to consider the possibility that repression is begun for certain reasons, escalated for others, sustained for others, terminated for others and perhaps reignited for still other reasons. Our project seeks to examine all of these topics as empirical questions. Similar logic has been employed in the areas of interstate war and civil war for quite some time. 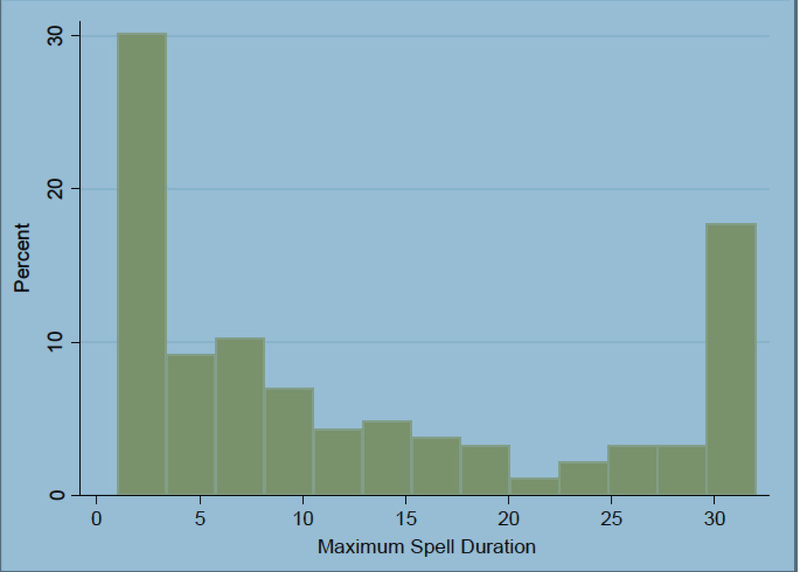 Toward this end, we have created a database on repressive spells. What is a "Spell" of State Repression? A spell of large-scale state repression is defined as the duration of time when government violence is above a certain threshold (i.e., a particular level of severity/lethality and size of the targeted population). 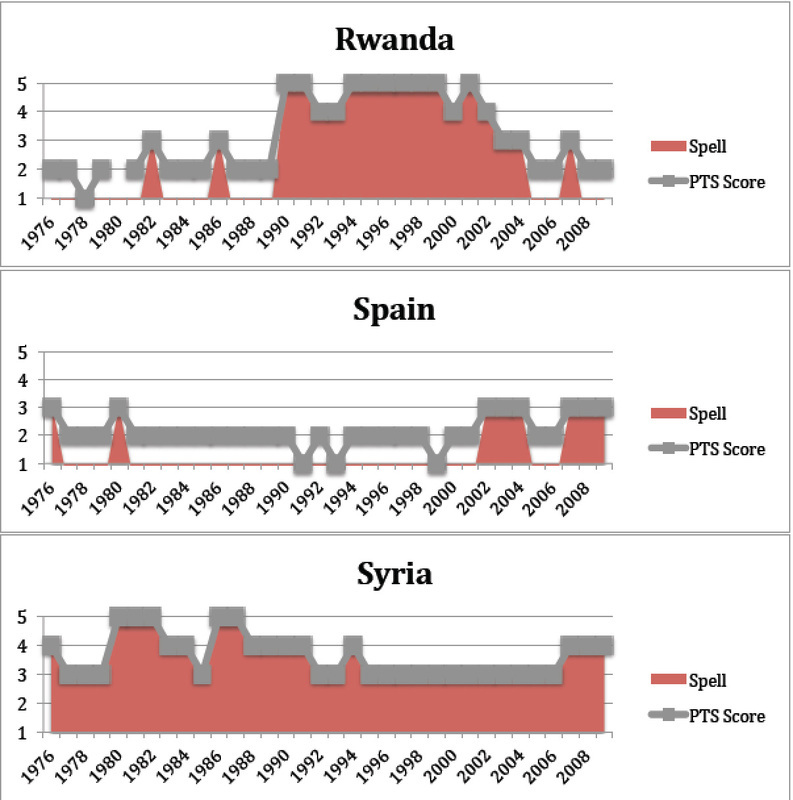 The threshold used to determine a spell within this study was derived from the Political Terror Scale (hereafter PTS) – the most popular indicator of repression in existing scholarship, and arguably the most relevant to our discussion as it simultaneously addresses the lethality of behavior enacted and scope of the population being targeted (Wood and Gibney 2010). The PTS measure is coded on an ordinal 1 to 5 scale. 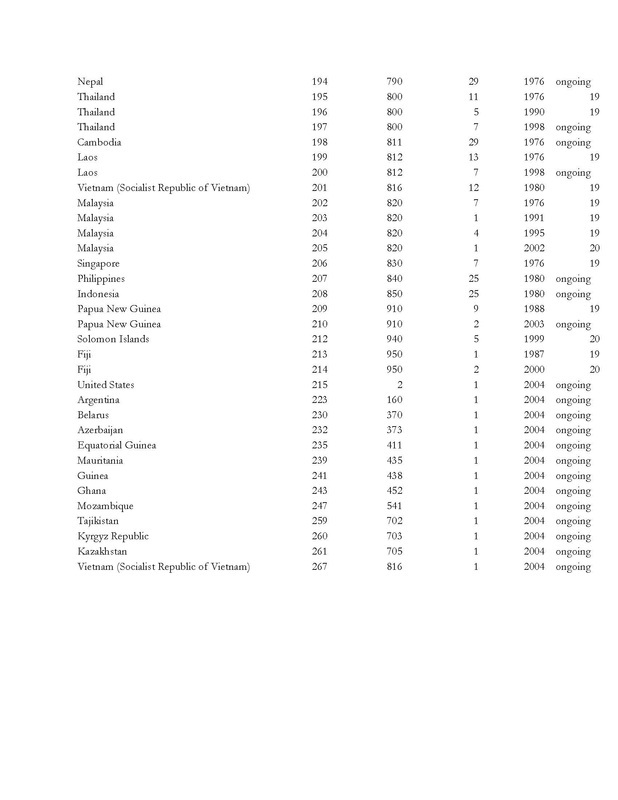 Scores of 1 and 2 correspond to countries where political torture, beatings, and murder are extremely rare and isolated. In contrast, a significant change is noted above level two which corresponds to the interest of theorists, activists and advocates alike. With a score of 3, there is extensive political imprisonment, execution and brutality. Moreover, unlimited detention for political views is accepted (with or without a trial). A score of 4 means that murders, disappearances, and torture have expanded to large numbers of people who engage in political life. A score of 5 represents an environment where state terror of the worst kind has expanded to the whole population, not just those engaged in political activities. Based on these definitions and given our focus, the threshold to determine a spell is a PTS score of 3 and above. This coding rule is consistent with prior academic work that looks at state repression in the worst situations (e.g., Hafner-Burton 2005). There is also face validity to using 3 and above to create the high repression spells. 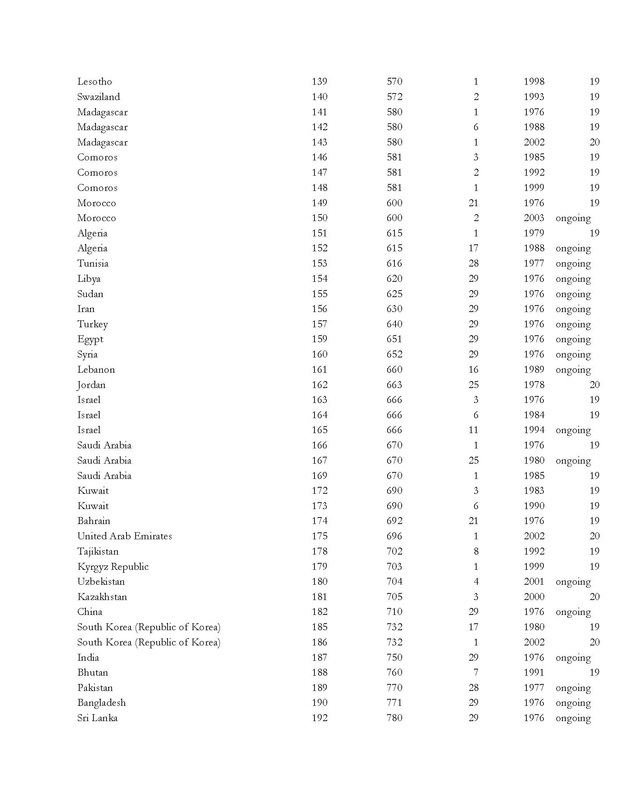 Comparing high-repression spells to the genocide/politicide data compiled by the Political Instability Task Force (e.g., Harff 2003), we find that all genocides/politicides since 1976 can be found within high repression spells. As designed, the data is structured so that once a country reaches PTS=3 (where repression becomes institutionalized and carried out systematically), the country is considered to be undergoing a repressive spell. This continues until the PTS drops below 3 for at least two consecutive years and the number of years at PTS 3 or above constitutes the duration. To illustrate, Zimbabwe experienced a spell from 1980 through 1987. In 1980, this country received a PTS score of 3, signaling its entry into a spell. 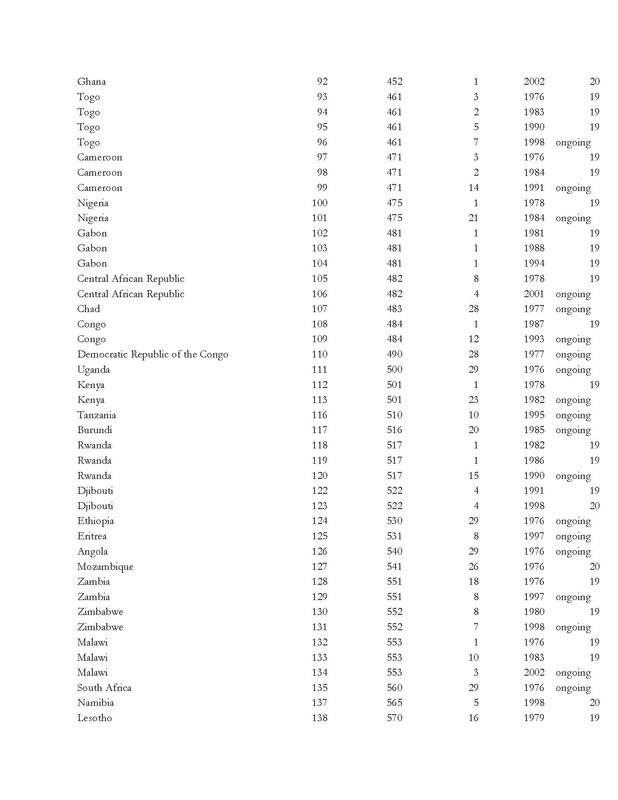 This reflected that during 1980, Zimbabwe experienced extensive political imprisonment, regular political murders, and unlimited detention for political views. This environment worsened over the next seven years as civil and political rights violations for those participating in politics increased alongside murders, disappearances, and torture. In 1984, the spell reached its zenith (level 5) when state-violence spread to the whole population, characterized by unrestrained activities being employed to achieve the government’s objectives. This is the year that the “Matabeleland genocide” or “Gukurahundi” hit its highest point with the systematic persecution of Joshua Nkomo and his Zimbabwe African People’s Union (ZAPU) followers by Robert Mugabe’s Fifth Brigade in the Ndebele regions of Zimbabwe (Catholic Commission 1999) killing approximately 20,000. After this period, repression diminished a bit but maintained behavior that was lethal, widespread and systematic. By 1988, however, the spell was over and the PTS fell to the level of a two. 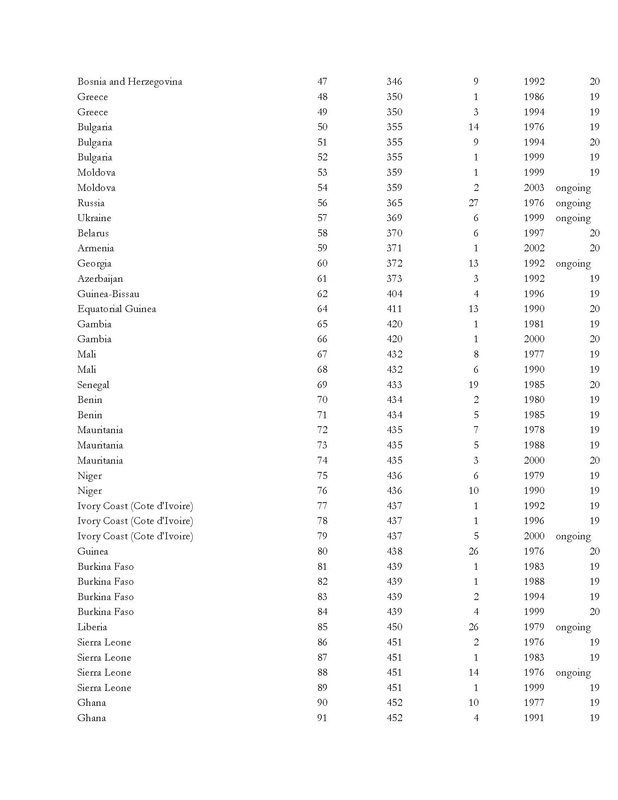 Adopting the coding rule noted above, the data contains a total of 239 repression spells that produce a total of 2,527 observations (i.e., spell years) for the period between 1976 and 2007 of all repression (both completed by the last year as well as those still underway). As the concept of repressive spells is new, numerous examples and a complete list can be found in Appendix. 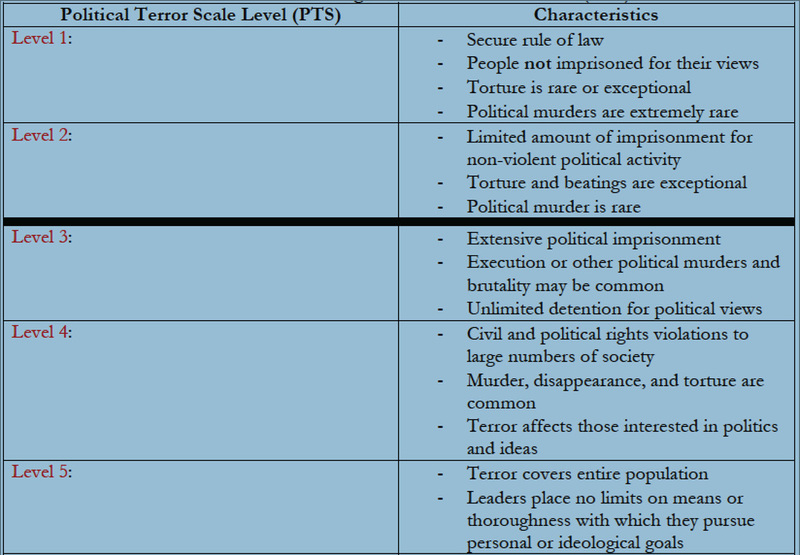 PTS measures the levels of “state terror” practiced domestically by a particular government and its agents on a yearly basis against those under their territorial jurisdiction for every country in the world (since 1976). 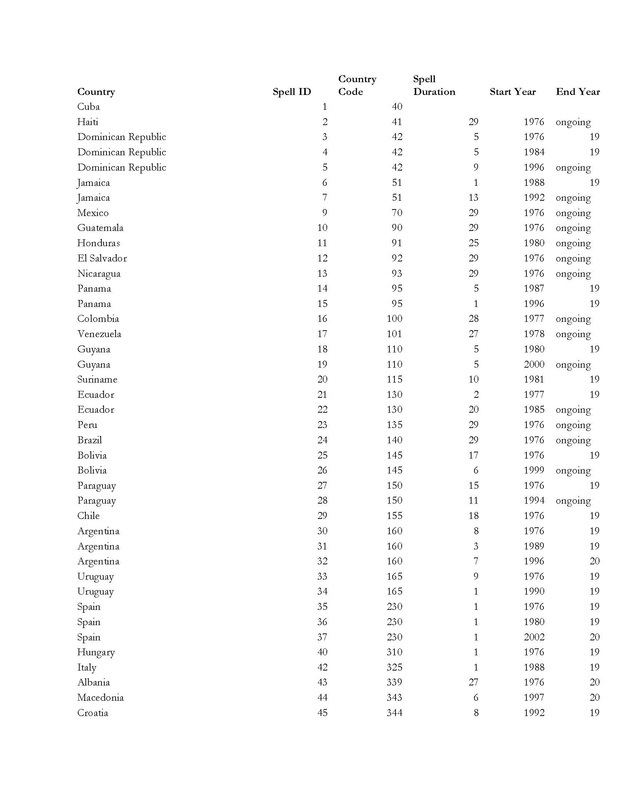 Some may be concerned that we are “losing” information contained within the original 5-category measure (effectively dichotomizing it) but the differences highlighted in the original data are irrelevant from the perspective of those interested in government repression that is violent, wide-spread and systematic. The cutoff is thus consistent with the subject and audience that we are interest in. This said, only about 6% of high-repression spells are also genocide/politicides. Spells are thus much more common than this category.